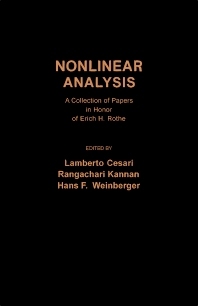 Nonlinear Analysis: A Collection of Papers in Honor of Erich H. Rothe is a collection of papers in honor of Erich H. Rothe, a mathematician who has made significant contributions to various aspects of nonlinear functional analysis. Topics covered range from periodic solutions of semilinear parabolic equations to nonlinear problems across a point of resonance for non-self-adjoint systems. Nonlinear boundary value problems for ordinary differential equations are also considered. Comprised of 14 chapters, this volume first discusses the use of fixed-point theorems in ordered Banach spaces to prove existence and multiplicity result for periodic solutions of semilinear parabolic differential equations of the second order. The reader is then introduced to linear maximal monotone operators and singular nonlinear integral equations of Hammerstein type. Subsequent chapters focus on the branching of periodic solutions of non-autonomous systems; restricted generic bifurcation; Tikhonov regularization and nonlinear problems at resonance; and minimax theorems and their applications to nonlinear partial differential equations. This monograph will be of interest to students and practitioners in the field of mathematics.